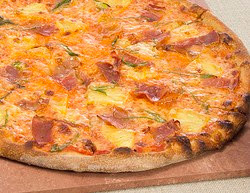 Typically Hawaiian pizza doesn't include chicken. That's why I really like this one, it's a twist on the traditional sweet n' salty combo that people love about the flavor. It also reminds me of Hawaiian chicken skewers which is why I prefer mine on the well done side, so the crust is extra crispy! I recipe of your favorite pizza dough, store made, frozen or prepared (for example, Boboli). Preheat oven to 450* F.
2. Bake on a pizza stone (lightly dusted in corn meal or flour) or sheet pan for 15-20 minutes, until cheese is melted and bubbly, and the crust is fully cooked.